There are many reasons for making a freezer paper stencil, but among the strongest would be that it's nearly fail and bleed-proof for painting. 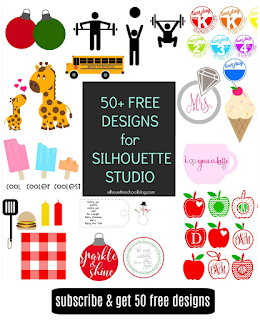 Your Silhouette can cut a freezer paper stencil, just as it would any other stencil making a detailed painting job super easy. Let me start off by saying, I have tried what feels like dozens of ways to stencil - from using an exacto knife to transferring images with wax paper and water to using newsprint and a pencil. Each method is good in its own way and much of it depends on what you are trying to stencil and what your mediums are...wood, fabric, walls, etc. A freezer paper stencil works best on fabric. 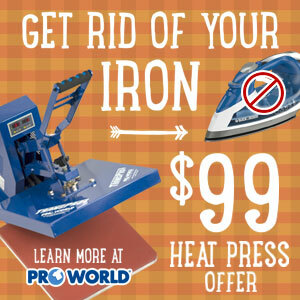 The reason is it can be ironed directly - and firmly - onto the fabric and will prevent paint from bleeding leaving you with a good clean, crisp paint line while stenciling onto fabric. I have used this method for pillows and table runners and it is nearly fail-proof. So you ready? 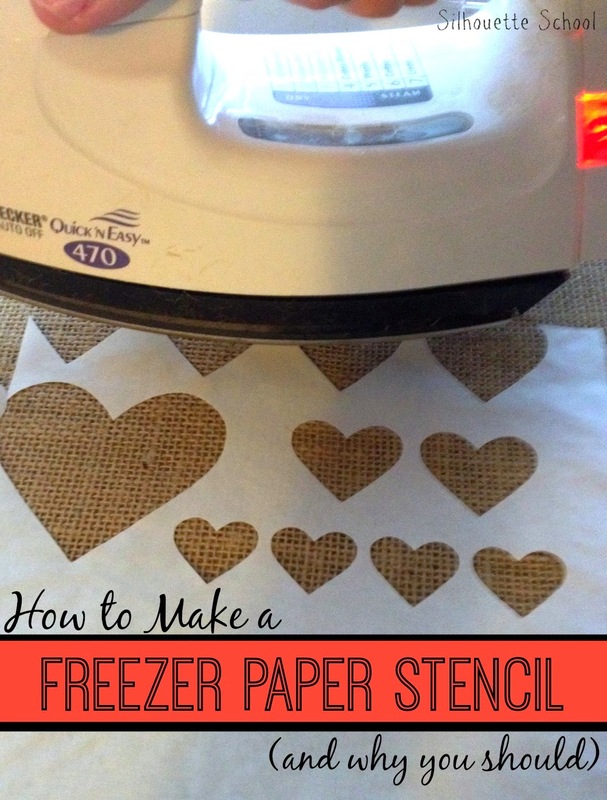 Let's get started - DIY freezer paper stencils are super easy to make. Cut a piece of freezer paper off the roll and trim it down to 8.5x11 or 12x12 (or smaller if your image isn't a full page size) depending on if you are using the Silhouette Cameo or Portrait. I work with a portrait, but the method is the same. Once the freezer paper is the proper size, remove the cover sheet from your cutting mat and lay the freezer paper - shiny side down - on top of the gridded/sticky area of the mat. On a flat surface, such as a table or a hardwood floor, press the the paper down really well, being sure there are no bubbles or bumps. 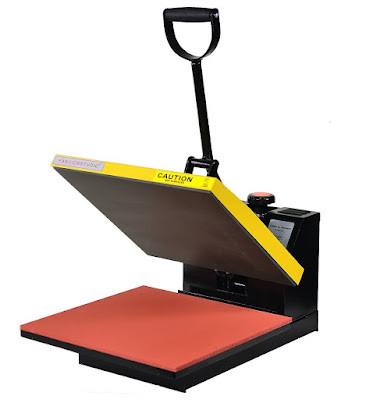 Now load your mat into the Silhouette, press the feed button, and set up your cut. Since the freezer paper is so thin set your blade to a 1 or 2. To be sure it cuts through perform a test cut where a little slice will be made at the top of your paper. If the blade is cutting through, go ahead and cut your full size stencil. Once the stencil is cut, carefully peel the freezer paper off the mat. The trick - and the most important step - is to now take that stencil, place it shiny side down onto your fabric, and run an iron over the freezer paper. This paper will start to crinkle a little as it sticks onto the fabric. This method is awesome because any tiny little detailed cuts that want to curl up when painted - won't! The freezer paper gives a nice tight seal ensuring crisp lines for painting the stencil - just be sure you're blotting up and down and not brushing your paint brush or sponge back and forth which can cause the stencil to move or come apart from the fabric. You can leave your stencil on your fabric until the paint dries, or remove it immediately. I like to remove mine right away. The only problem with freezer paper stencils is they're not re-useable. The paint makes the paper too thin for repeated use. However, that's a small price to pay for the crisp lines and no-fail paint stencil. 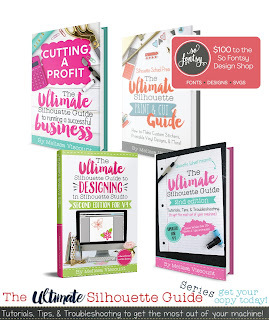 I have used freezer paper stencils cut from my Silhouette on burlap (as seen in this tutorial) and drop cloth (below) and it works beautifully. Wondering what I made with all those hearts? 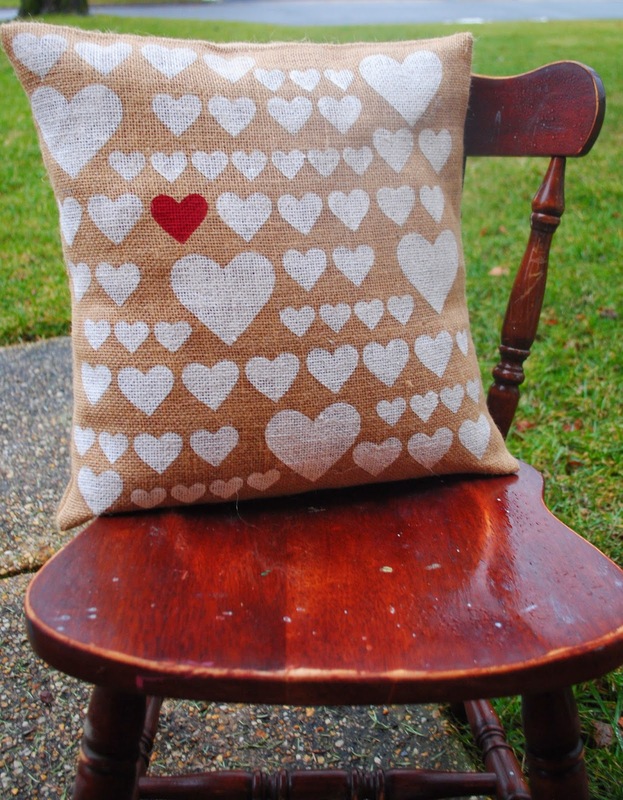 Here's the finished product...check out our sister site, Two It Yourself, for the full tutorial on making this Pottery Barn knockoff heart pillow. 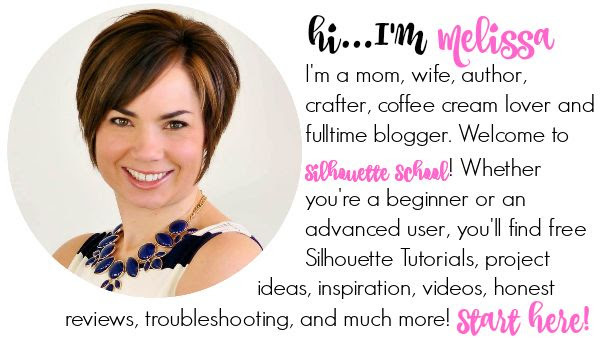 Thanks for coming to class today at Silhouette School, if you like what you see, I'd love for you to pin it! This is so helpful! 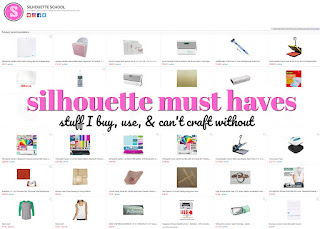 If I ever get a Silhouette, I know where I'm coming to get schooled ;-) Thanks so much for sharing...pinning! You make it look so easy! Now I just need to convince hubby that I need a Silhouette... ;) Thanks so much for sharing at Hit Me with Your Best Shot! Have a great week! Abby, my husband got it for my for Christmas. I got the Portrait - it't smaller and not quite as pricey as the Cameo. I think either would be worth the investment though! I want to know how you make the Valentine stencil you're using on the dropcloth -- what program creates those? Dying to make my own. I have a silhouette and tried making some t-shirts following your directions but my paint kept bleeding thru. What could I be doing wrong? Are you putting cardboard in between the shirt so the paint doesn't bleed? Does this method work on a canvas? would or does this method work on wood? I am wanting to make some signs for Christmas and stencil them but I don't know what to make my stencil out of? My daughter has had the Silhouette Cameo for a few years now and now she lives over 2 hours away so my Hubby bought me a Cameo for Christmas!!! I was so suprised but I love it!!! 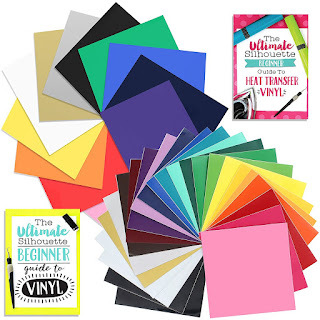 I bought the Silhouette Curio and tried the freezer paper idea, cut great, every detail but when it came time to remove the paper from the cutting mat I couldn't get it off, it tore no matter how slow I went and the pieces stuck to the mat, I had to scrape them off. Suggestions? If it is a new mat rub it on some jeans so it isn't so sticky. I had to do this even when using cardstock. I seen it in a video somewhere when I first got my cameo. It works wonders. is it possible to paint, then put another layer? or would it all have to be done at one time? If you let the first layer dry completely then there should be no reason you couldn't do another layer. Getting it lined up would be the only challenge. Melissa Viscount, even though my mat is worn I still have problems with the shiny side of the paper sticking to the mat. Either the whole piece sticks to the mat or there are parts where the paper comes up without the shiny side on it. Any suggestions? I did a very long saying on a t shirt and some of the freezer paper was not sticking right on my mat so I took my Iron and went over the wax paper while it was still on my mat, not only did it separate the cuts, I did not have to weed anything. With the freezer paper still warm,it pulled right off. What cut settings do you use for freezer paper?